We all know that a weight loss journey like TFR is more than just a diet, it is a complete lifestyle change. The new habits picked up a long with way makes the continuation of a healthy lifestyle after the diet is over a more manageable tasks. Throughout this journey we start to appreciate new approaches to food, a new admiration for exercise and a positive change in mindset. All of these can have an overwhelming affect on your daily routine. It is all well and good talking about these now but how do you actually achieve them if you are only starting out? 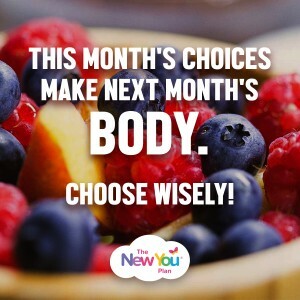 Whether you are on plan or just want to live a healthier lifestyle learning about what you put into your body is so important to feeling good. The right foods will give you an increase in energy, remove that bloated feeling and provide you with a good nights sleep without the uncomfort. Making the right choices will have a remarkable impact on your lifestyle. If you are on a TFR meal plan like ours then the hard work has been done for you. All our packs are nutritionally complete containing 100% of you RDA and 23 different vitamins and minerals. 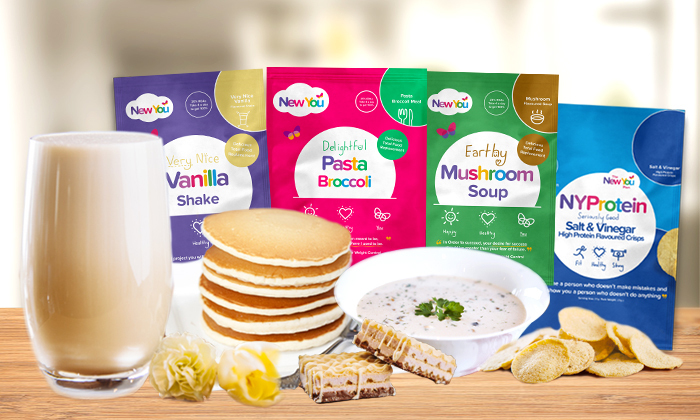 By providing the simple instruction of 4 packs we are removing the added stress of calorie counting as this has already been carefully calculated by leading nutritionists. With over 40 options to chose from we make adding nutrition to your lifestyle an easy task to complete. If you aren’t on plan and want to add a healthier approach to your food then you should consider the following factors. These tips could also be considered when on the re-feed part of your TFR plan. Variety: you are exploring new foods in all food groups to see what works best for you. You may find a new favourite. Portion size: we have all heard the saying ‘a little of what you fancy’ but this can be applied to all varieties of food including healthy choices. Invest in a portion plate to section off your food so you aren’t over indulging in one area or simply use a smaller plate. By making these changes you are already on your way to breaking the bad food habits you have picked up along the way. Food Groups: We all know the basics of what is good for you and what is not but by making simple changes like having a piece of fruit as a snack instead of crisps or filling up on vegetables instead of carbohydrates will significantly improve your nutritional benefits. TIP! 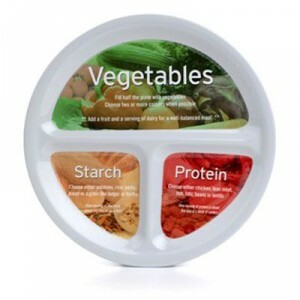 Plan your meals in advance, whether on a total food replacement or healthy eating, planning is key to your success! Adding exercise to your routine is such a valuable contribution to your lifestyle. Whether it is 10mins or an hour, every little counts to creating a healthier, happier you. Exercise is so important to preventing long term health problems, it is a crucial factor in maintaing a healthy heart and reducing the risk of heart disease and diabetes and can reduce aches and pains and it will improve muscle growth and repair. A brisk walk each day or a light jog will really clear your mind and allow you to focus on your daily tasks. Exercise is not only great for your body but also for your mind providing a positive impact on your mental health as it allows you to de-stress and shake off those negative vibes. Working out along with people can sometimes be the best form of motivation. Why not join our special Fit Bit group full of fellow Secret Slimmers to ease exercise into your daily routine. Join here! TIP! Add motivation to your workout, track your steps each day and try and improve on the number. This way you can set yourself weekly goals to smash! The best things in life are free and what is more free than water! This simple purity has been around for centuries and its uses and advantages are endless. With it being so accessible it is easy to take it for granted but the power it holds in terms of health and weight loss should not be overlooked. By drinking a glass of water you increase your metabolic rate by 30% approx 1 hour after consuming (Research found by the Journal of Clinical Endocrinology and Metabolism). 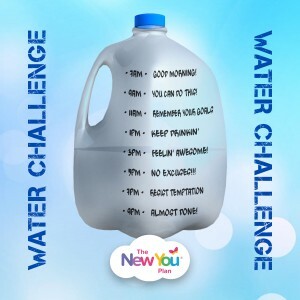 Try and set yourself goals to up your water intake, start with 1 litre a day and build it up until you reach 4. By consuming so much water you will curb your cravings and feel better inside and out. Water has incredible qualities to improve complexion, energy levels and alertness. TIP! : Not a fan of water on its own? 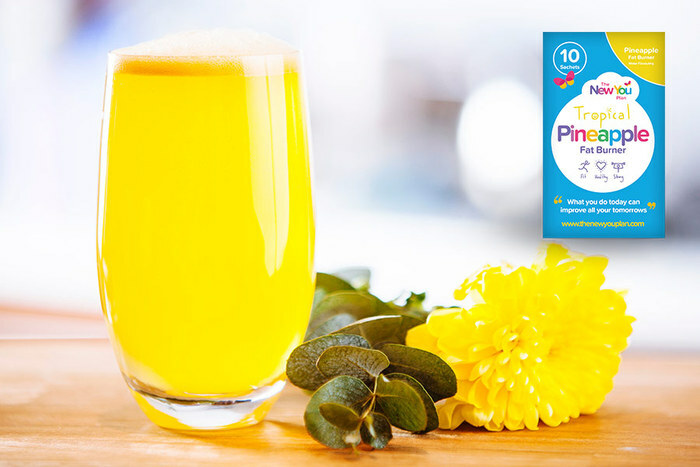 Add New You Plan water flavourings or Pineapple fat burners to make it easier to drink. Get yours here! Never underestimate the power of sleep, it is a crucial time to let our bodies repair themselves and for our finds to process the thoughts and information received that day. It is recommended we get a minimum of 8 hours sleep a day, anything below this can leave us irritable, creates a weakened immune system and reduces productivity for the day ahead. A good morning routine is almost as important as a good nights sleep, this can be a hard habit to break but once you have put a plan in place and stick to it it can become everything you need to make your day great. By creating a routine that sets your tone for the day you will achieve great things, think of your essentials e.g. coffee, make-up, outfit etc, and plan these out in advance taking away the morning stress of decision making and creating a calm morning start allowing you to think of your day ahead. TIP! : Technology can have a negative impact on a good night sleep, make your bedroom a phone free zone and have your alarm positioned in a place that you have to get up to turn it off. This prevents you from hitting snooze and gets you up and ready from the get go! It goes for any lifestyle change or bad habit, the reasons we look for improvement is for ourselves. Embrace the ‘I can do this’ attitude and believe in yourself. Don’t surround yourself with people with negative attitude, it will only bring you down. Find the positive people you can shine off and feel empowered in what you plan to achieve. TIP! : Keep a journal of positivity, what you like about yourself, an inspiring thought for the day and something to keep you motivated. You can revisit any of these when you need a boost of positivity in your life! By adapting these 5 different habits to your lifestyle you will be improving the health of both your body and mind. To really set you up for a brilliant 2017 we have created ‘A New Me in 2017’ wall chart to keep you focused on creating the best you possible. Complete with daily updates for each habit you can test yourself to improve week after week. We want to make this year the year of possibilities so set yourself mini goals for Nutrition, Exercise, Water, Morning and Empowered and see how you can build on each. This is a journey of discovery so don’t think you need to take them all on at once. If you improve in one area at a time it is still better than where you were when you started out. 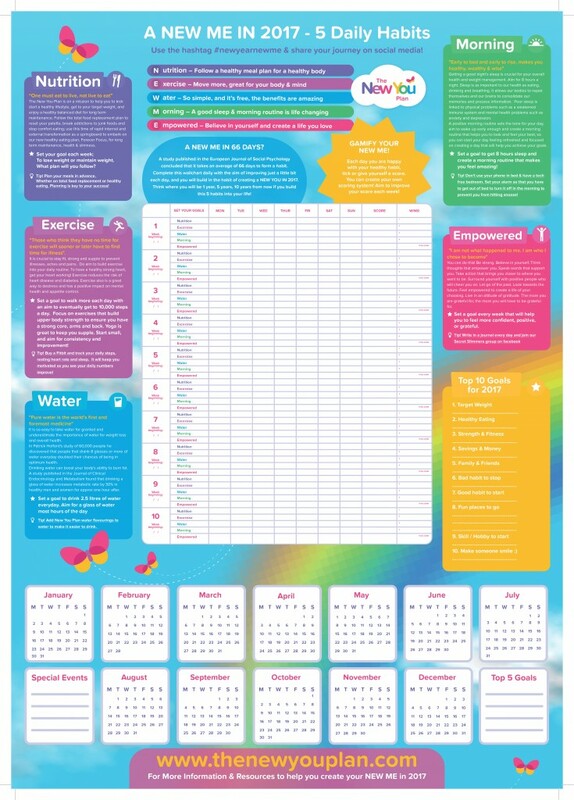 Log your improvements on your New Me Wall Chart and track your progress throughout your journey. Get your New Me Wall Chart..
Our New Me in 2017 Wall Chart is for Sale at £4.99 on our website or get one absolutely free if you spend £50 or more! 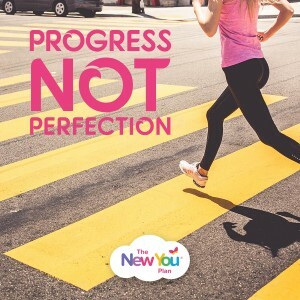 Get yours now > To set you off on the right track all new customers will receive a 21 day journal to help them keep record their progress every step of the way. Make 2017 the year you waved goodbye to bad habits and start reaping the benefits of the 5 steps to a healthier lifestyle! 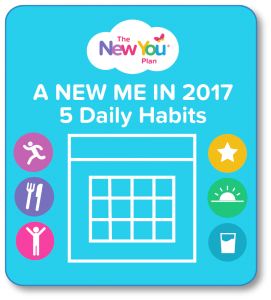 START 2017 STRONG WITH THE NEW YOU NEW YEAR BUNDLE! Package.This bundle contains EVERYTHING you need for a WOW transformation in 6 weeks that will make you slimmer, healthier, energised and more confident about creating a New You in 2017. What you will get: 180 TFR Meals and Snacks of your choice, 21 day journal, Free Wall Chart (as above), Project New You, Exclusive Coffee Travel Cup, 100% Cotton Tote bag + much more! SAVE 61% and get yours now!